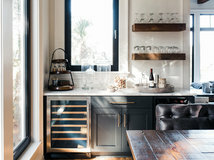 Neutral palettes dominate the most popular kitchen photos uploaded to Houzz during winter 2019, with many dreamy spaces decked out in white or gray. 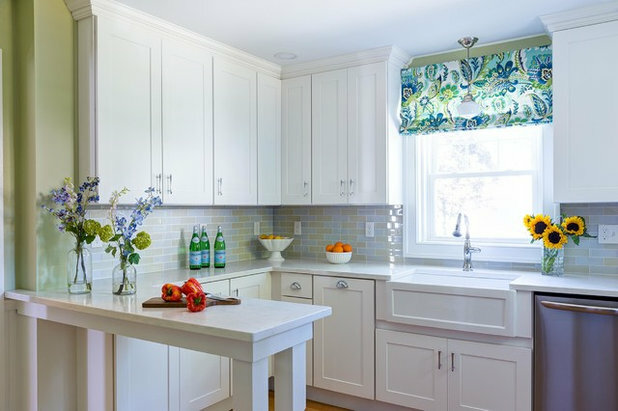 White is still tops in terms of cabinet colors in remodeled kitchens, while Shaker remains the top cabinet style pick, according to Houzz data, and these kitchens reflect those trends. 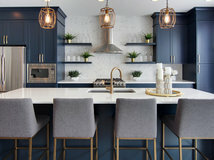 These kitchens also showcase some dark countertops and black or sage green cabinets, reflecting emerging trends we’ve recently noted. 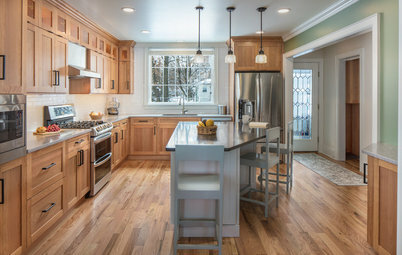 Here’s a countdown of the 10 most popular kitchen photos on Houzz so far this year. This kitchen built by general contractor Buckminster Green has dark base cabinets, white walls and dark wood shelves with appealing visible brackets. The backsplash tile has a distinct petite size and vertical shape and is a pleasant alternative to classic white subway tile. Should You Use Open Shelves in the Kitchen? The owners of this center-hall Colonial outside Boston entertain often and wanted a large kitchen island that people could gather around. 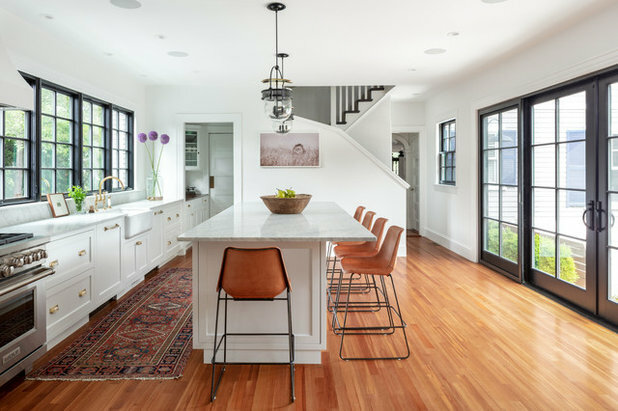 Designer Kelly McGuill of Kelly McGuill Home chose Shaker-style white cabinetry on just the left half of the room to keep the space feeling open, while the lack of upper cabinets allows light to flood in from the windows. 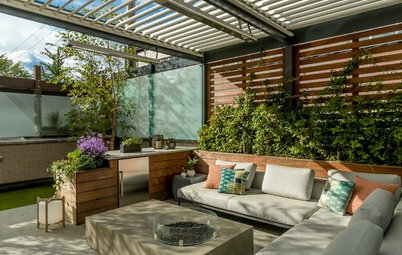 The layout leaves a wide walkway between the kitchen island and sliding doors, a convenient feature for entertaining. The floors are reclaimed longleaf pine and match the home’s original flooring. Black around the windows and doors brings a modern feel to the kitchen. 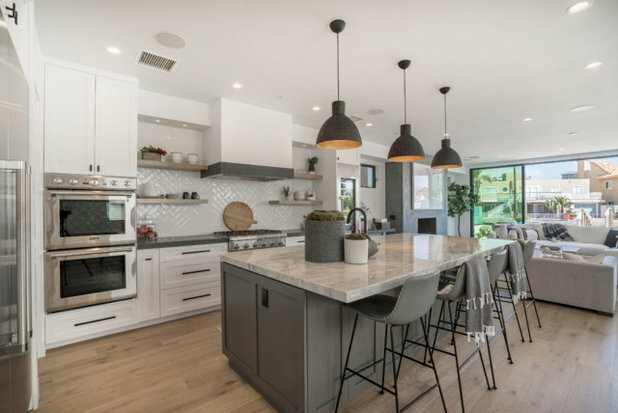 Interior design firm Three Salt Design paired a white quartz countertop with a white-and-gray marble backsplash in this lovely Los Angeles kitchen. 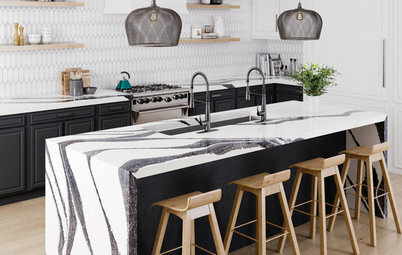 Engineered quartz is the most popular countertop material for remodeled kitchens, according to Houzz research, while natural stone (including marble, among others) is a close second. This kitchen manages to incorporate both materials beautifully by using marble for the backsplash. 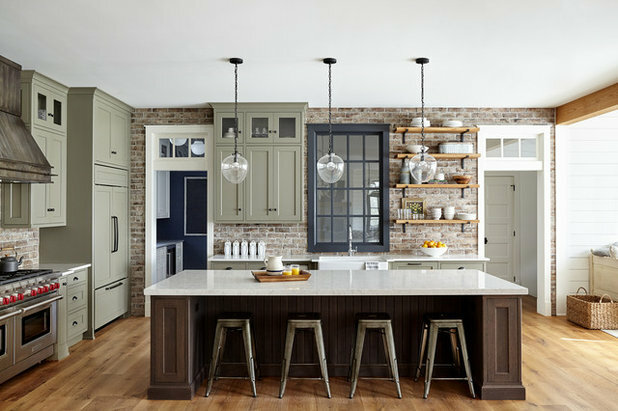 This kitchen from designer Liz Merry of Willow Home and architect Amy Dirkes of Nor-Son Custom Builders features rich gray cabinets painted in a low-luster enamel finish. The color (Gauntlet Gray by Sherwin-Williams) was a perfect match for the gray veining in the countertop and backsplash, which are both Lincoln Gold Vein marble in a honed finish. The perimeter counters are engineered stone and the flooring is walnut with a custom stain. 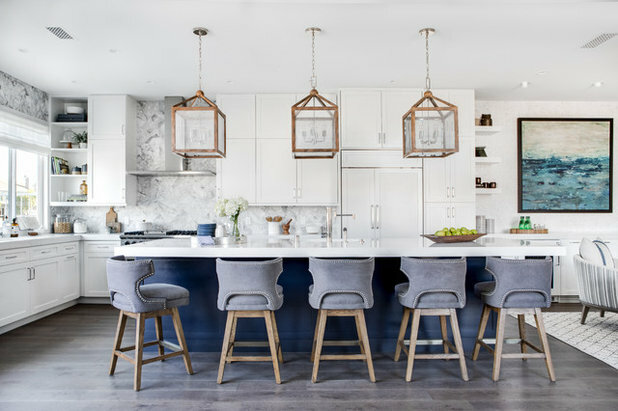 This kitchen from Gia Milazzo Smith of Designs by Gia Interior Design and Renovation features a number of popular elements in remodeled kitchens. One is the white cabinets, which are in the Shaker style. 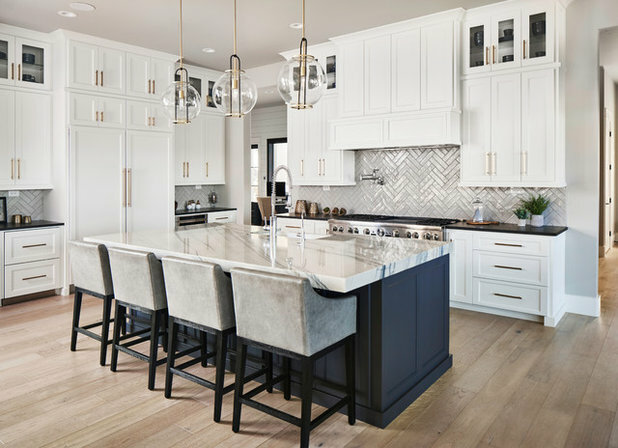 Another is a white quartz countertop, both the most popular material and color for counters in renovated kitchens, according to Houzz research. The wall color is Guilford Green by Benjamin Moore. 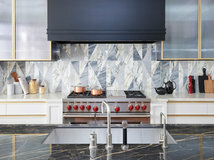 The rectangular green-and-white backsplash tiles are made of glass. This white kitchen from MSA Architecture + Interiors marries timeless white Shaker cabinets with a gray herringbone tile backsplash and ashy wood floors. The range hood is cleverly hidden behind paneling that matches the ceiling-height cabinetry. 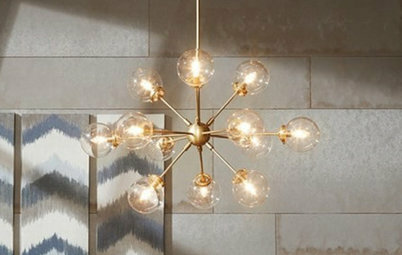 Three pendants over the island dress up the room like jewelry. A dark base for the island and dark kitchen counters bring attractive contrast to the room. 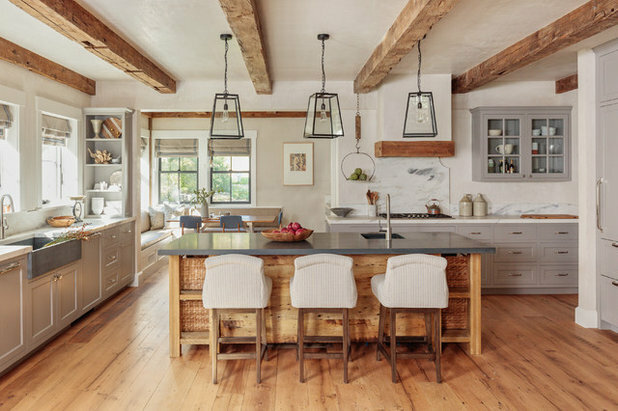 Designer Jess Cooney of Jess Cooney Interiors incorporated antique reclaimed beams and plaster walls in this Massachusetts kitchen to give it a rustic, aged style. 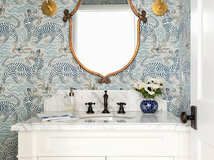 The perimeter countertops and backsplash are made from Danby marble, sourced from nearby Vermont. The island countertop and the apron-front sink on the left wall are made from Pietra Cardosa, which resembles soapstone but is more durable. The island base is more reclaimed wood. Iron lanterns above the island add to the aged look. The flooring is reclaimed oak, with planks that range from about 8 to 15 inches wide. 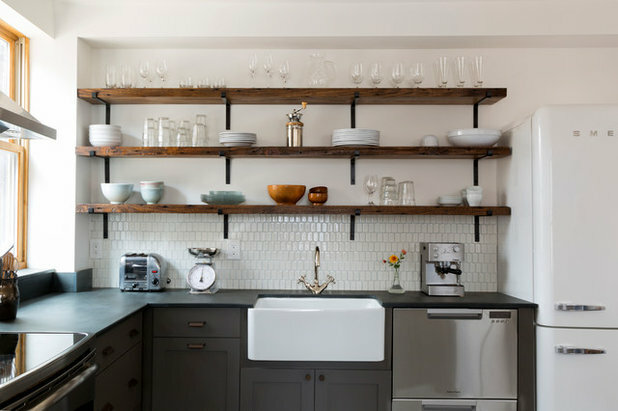 Designer Lisa Furey of Lisa Furey Interiors blended brick walls, a beautiful soft sage-gray cabinet color and attractive open shelving in this kitchen. A rich brown island base with a bright white counter makes an inviting place to chop vegetables or gather for a cup of juice or tea. 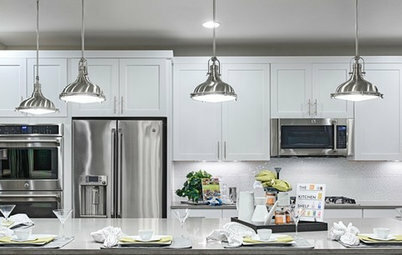 This kitchen is in a model home in a community with several competing builders. 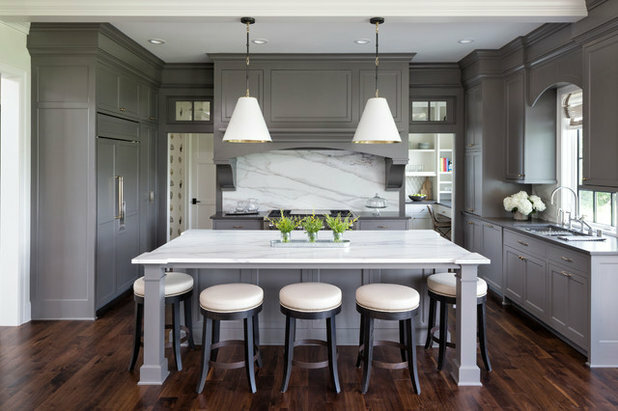 To stand out, designer Christina Wilcocks and design assistant Elena Liz, both of Normandy Homes, started with dramatic dark cabinets (Iron Ore by Sherwin-Williams). 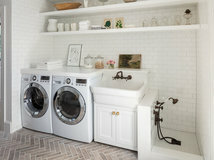 They added brightness with natural dolomite countertops and a Calacatta marble backsplash in a brick pattern. 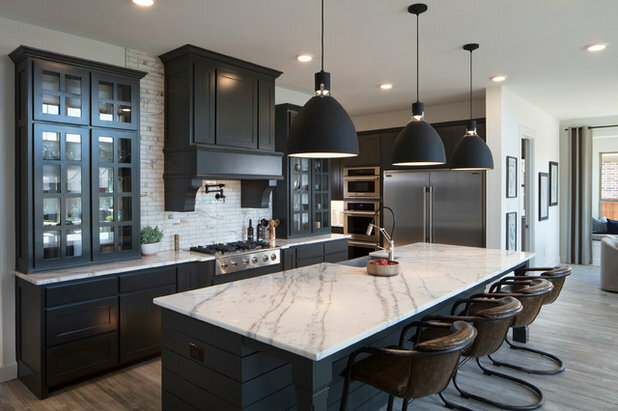 Oversize black pendants and a custom vent hood add style, while glass-front cabinets on either side of the range reflect light from the floor-to-ceiling windows on the opposite wall. White Shaker cabinets, open shelving on either side of the range hood, a charcoal island base and beautiful oak floors drew the eye of Houzz users to this photo from general contractor Cornerstone Construction and Property Services. Also notice that the detail on the range hood matches the perimeter counter — they’re the same gray engineered quartz. 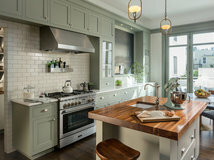 This is the most popular new kitchen photo uploaded to Houzz so far in 2019. Your turn: Which of these popular kitchen photos do you like best? Please tell us in the Comments. Thassos Marble Hexagon Tile, Polished, 12"x12"
Those heavy, clunky bar stools just ruined #2 for me. 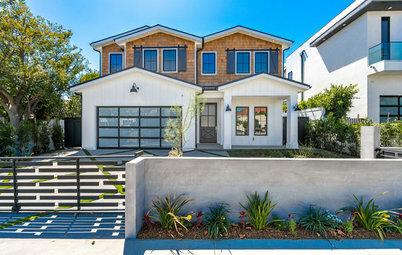 There are lots of options that would be far more complementary to the design. 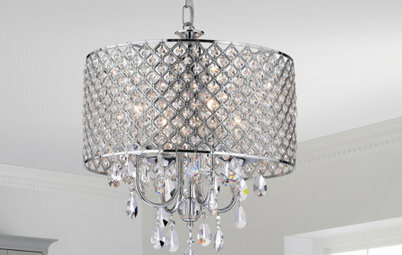 Why not something light to contrast with the dark cabinets and lighten the look? Numbers 3 and 4 re my favorites. @schroederbaker Thank you for sharing your knowledge. I just ordered one. I'll let you know how it works out for me. I like #8 the best - at least it has some color!